Animonda Carny Senior is balanced and healthy food for cats over the age of 7. This irresistible food contains real pieces of meat. Carny Senior offers all older cats all of the essential nutrients they need. 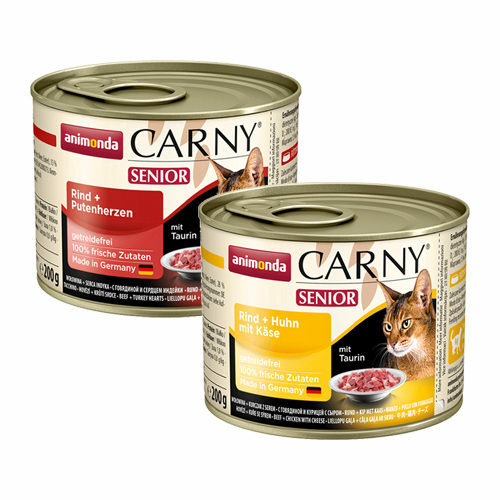 Carny Senior, made by Animonda, is special food that has been specifically composed for cats over the age of 7. This food contains delicious pieces of meat, making this food a real treat. Carny Senior is balanced, tasty and healthy food that contains all the important nutrients older cats need. This delicious wet food contains natural taurine, which helps improve overall health and has a positive effect on the heart, nervous system and eyes. Beef, chicken and cheese Beef (33%) (lungs, heart, kidney meat, udder), chicken (28%) (liver, stomach), cheese (4%), calcium carbonate. Beef, chicken and rabbit: Beef (50%), (meat, liver, lung, heart, kidney, udder) turkey heart (15%), calcium carbonate. Have you used Animonda Carny Senior before? Let us know what you think about this product.